I have been eyeing the new Converse Lights for a while, they are similar to the classic All Stars but have a thinner more girlish shape. I have had the same old high top Converse since I was a teen and sometimes I think they are a little too clunky, especially when worn with skinny jeans. 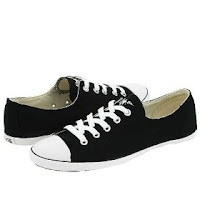 For a long time I have wanted a converse like shoe that is more lady like. I found what I was looking for about four years ago when Urban Outfitters came out with the shoe on the right. I was a teenager at the time and the thought of spending $40 of my hard earned money I made from Bath and Body Works was appalling. As it turned out I never got these cute shoes, although I now wish I wouldn't have been so stingy with my money. Ever since then these shoes have never left my mind and I am have to say the new Converse Lights seem to live up to this long standing dream, they even have a super cute skimmer version that is rather similar to the Urban Outfitters pair. I have to say I wanted the high top version at first, but after looking all over the internet for an affordable pair, I found the low top version on sale at Sears.com for only $20. They are only available in size 8 and 11 though so if you want a pair you may be out of luck. They do have different colors for only $29.99 at Delias.com in a wider variety of sizes, although they do not carry the classic black and white. Even though it is still hard for me to justify spending $40 on canvas shoes I may just have to get the skimmer awell. oh, these are definitely some cute shoes! i really like the look of the lights...they are very classic looking and yet feminine looking at the same time.